(Bloomberg) -- Saudi Aramco is offering its debut dollar bonds at yields similar to the kingdom’s sovereign debt after attracting more than $40 billion from investors. 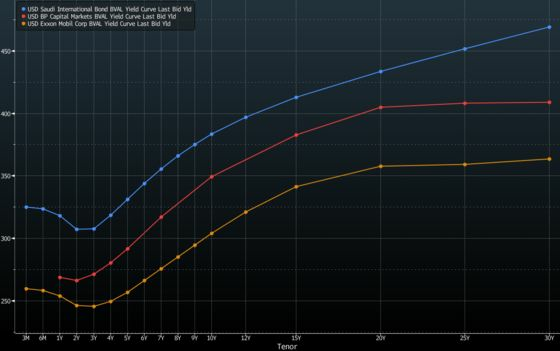 The world’s biggest oil producer set initial price guidance on 10-year debt at around 125 basis points over U.S. Treasuries of similar maturity. That’s equivalent to a yield of about 3.75 percent, compared with 3.74 percent for Saudi sovereign debt with a similar maturity. Though a contender for the highest rating from Moody’s Investors Service, Aramco’s state-owned status means it shares Saudi Arabia’s A1 sovereign credit score, which is five steps below the top grade. The issuance is expected raise as much as $15 billion. Aramco’s rating from Moody’s is the same as BP Plc’s. The yield on the London-based BP’s bond maturing in 2028 was at 3.4 percent. Aramco plans to use proceeds from the bond sale to help fund its purchase of a 70 percent stake in Saudi Basic Industries Corp. for $69 billion. The offering forced Aramco to disclose its accounts to investors for the first time since its nationalization about four decades ago. It’s also a precursor to even greater transparency required for an initial public offering, planned for 2021. Exxon Mobil Corp. has a triple A rating from Moody’s and the second-highest level at S&P Global Ratings. Aramco’s rating followed state-owned Abu Dhabi National Oil Co., which got a AA long-term credit rating at Fitch in February. Aramco had mandated JPMorgan Chase & Co., Morgan Stanley, Citigroup Inc., Goldman Sachs Group Inc., HSBC Holdings and NCB Capital to manage the offering, according to a person familiar with the matter.